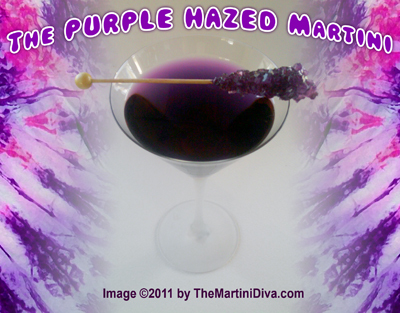 PURPLE HAZED MARTINI for Jimi Hendrix's Birthday! 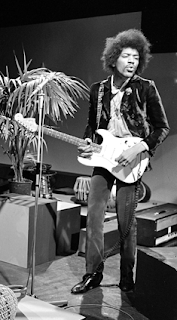 Dedicated to the man who was one of the (if not THE) guitar greats of our times, James Marshall "Jimi" Hendrix (born Johnny Allen Hendrix), born into the world of rock and roll this day in 1942. I am one of the lucky ones who had the opportunity to hear Jimi and The Jimi Hendrix Experience play live several times, the first time at the Monterey Pop Festival in the summer of 1967, the last time at the original Woodstock in 1969. To hear that performance of the Star Spangled Banner at Woodstock was a mind bending experience. 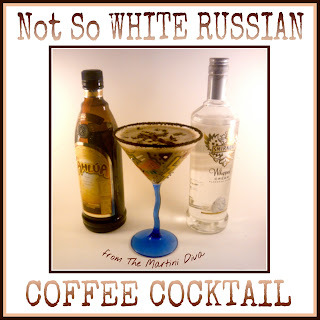 I was inspired when I got my sample of Smirnoff's Whipped Cream Vodka today and gave it my usual taste test whirl. First, I opened the bottle and took a nice deep whiff - believe it or not, one of the first things involved with drinking (and eating) is your olfactory sense. Your nose plays a large part in the flavor profile of anything you ingest. What wafted up from this bottle first was a distinct smell of caramelized sugar. It put me more in mind of a baked custard than whipped cream. My next step is to taste the vodka straight - at room temperature and ice cold out of the freezer. In this case, the freezer was not the vodka's best friend, it was more pleasant warm, I think the cold disguised some of the warm caramel elements and brought forth more of the vodka qualities. The burn was more pleasant on the warm vodka as well, it was cozy and like cuddling up into a nice blanket on a rainy day. I was pleasantly surprised by this "vodka". I fully expected an over done, imitation vanilla flavor with a bitter after taste and what I got was a pleasant, sweet sipping liqueur - and I do think that this new "vodka" is more of a liqueur than an infused vodka. It's extremely sweet, which is not the usual case with an infused vodka. I also noticed that the bottle lip was sticky which means sugar has been added. To me that means a liqueur as opposed to a base spirit (liquor). 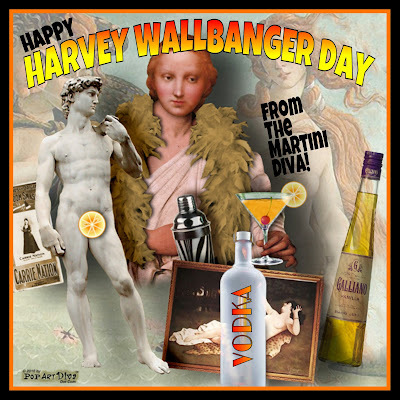 But I won't quibble about the issue - heck, I'm the woman who will put just about anything in a martini glass and call it a martini! If Smirnoff and others want to call their whipped cream liqueurs "vodka" more power to them. 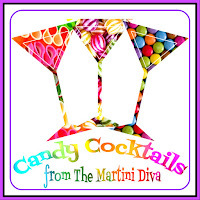 All I care about is are they good and can I make a good martini from them! 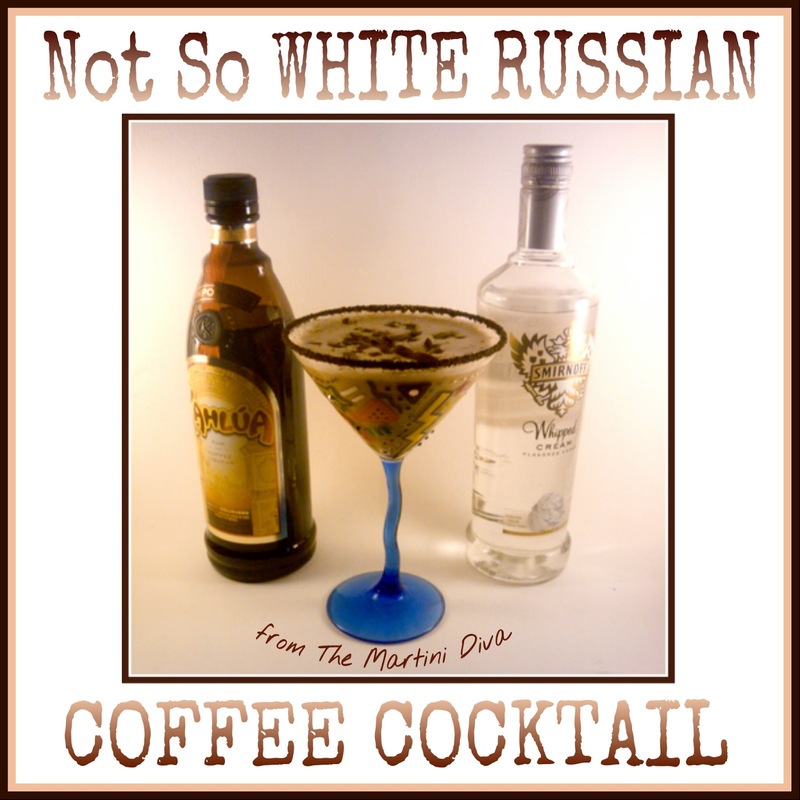 As for my Not So White Russian Martini, well it's not so white and it's not so Russian because of the addition of espresso to the classic White Russian recipe - but it's still a great cocktail for National Espresso Day! 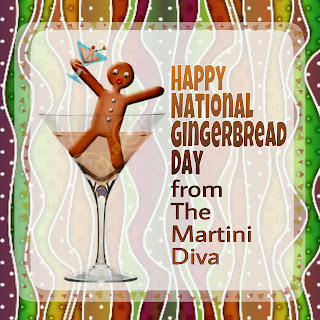 There's some debate about whether National Gingerbread Day is June 5th or November 21st. Since gingerbread is pretty much a holiday food, I'm going with November 21st on this one, but I'll gladly celebrate it twice a year since I love gingerbread! Never go to a person's house as a guest without a hostess gift! 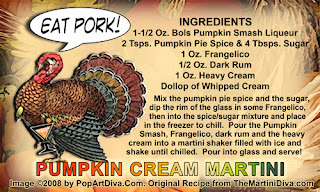 A friend of mine raved about his "Granny's Pumpkin Eggnog" and asked me to create a cocktail based on her recipe. Because I'm not a huge eggnog fan, I have to honestly say I didn't think this would taste good at all but I'm willing to try anything once so I gave it a go. 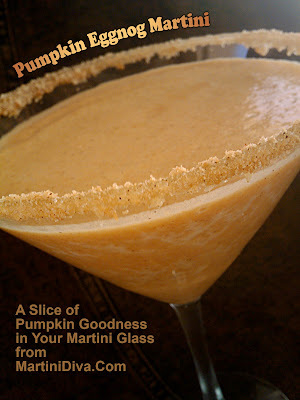 Like the Pumpkin Pie Martini I created ages ago, I was pleasantly surprised by this cocktail. I did not use his Granny's eggnog recipe but used a pre-made eggnog instead. I also did not cook and scrape out a pumpkin (even for a good friend that's a lot of work when trying out a new cocktail), I used canned pumpkin puree, but even without his Granny's tender loving care and ridiculous amount of work, this tasted great! Pour the ingredients into a cocktail shaker filled with ice and shake vigorously until well blended. Pout into the chilled glass, sprinkle on the vanilla seeds, dust with a sprinkling of pumpkin pie spice and serve. Get yourself invited to another person's Thanksgiving dinner. Time to do the grocery shopping for the bird and everything except the fresh greens, breads and seafood. Figure about 1.3 to 1.5 pounds of turkey per guest! 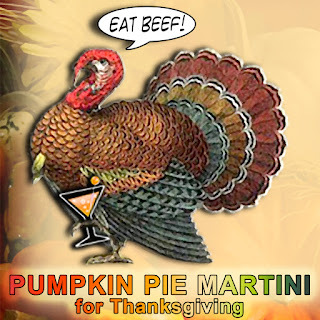 If you're ordering a special bird - duck, goose, turducken or a deep fried turkey - order now! 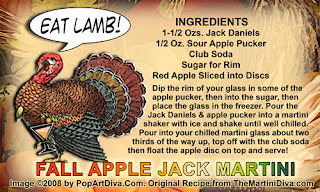 Have yourself a couple of these Fall Apple Jack Martinis at the end of the day - you'll need all the relaxation you can get before the big day! It's just about one week before the big meal and now is the time to clean out your refrigerator to make room for the turkey and all those side dishes you'll be serving! You should also get your shopping list together if you haven't done so already, and don't forget about special cooking equipment you might need! Making homemade pies? Make your crusts now and freeze them to save time on the big day. Reduce some of the stress of cooking and footing the bill for that big meal. 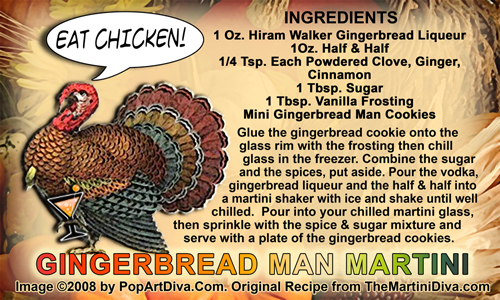 Cook the turkey but ask your guests to bring a side dish. Ask for their "specialties" by saying something like "it just wouldn't be Thanksgiving without your fill-in-the-blank!" Supply a nice wine for the dinner but BYOB is the rule for the booze - you're not required to host a full bar and, if they don't drink it all up, you might get a few ounces leftover for your martinis after. Order your pies from the local bakery or a pie chain. Book a Thanksgiving cruise and avoid the whole issue! Just wait a minute, I can hear you saying "Euww" but don't be too quick to judge. Pickle brine is a spiced vinegar solution, vermouth is an aromatized, fortified wine with added botanicals. They are culinary relatives. Not so far fetched now, is it? 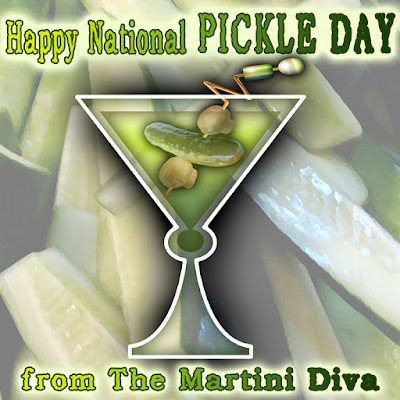 Think of it as a Dirty Martini that replaces olive brine with pickle brine. 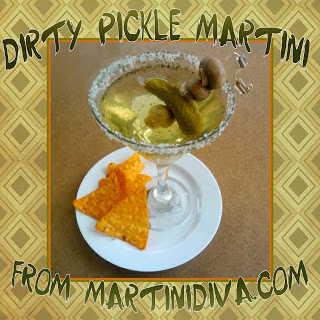 If you like dill pickles and martinis, you'll like this cocktail. For my version's below I did one replacing the vermouth with pickle juice (brine) and one with both. My preference with the dill pickle is for gin, but vodka is good as well. In one plate, mix two tablespoons of kosher salt with 1 teaspoon of dill weed. Add 2 tablespoons of pickle juice to the other plate. Get your classroom in the pickle juice and then into the salt mixture, then chill glass in the freezer. Fill your cocktail shaker with ice pour in the gin and the pickle juice then shake until chilled. Straight into your chilled glass, garnish and serve. Add 1/4 Oz. 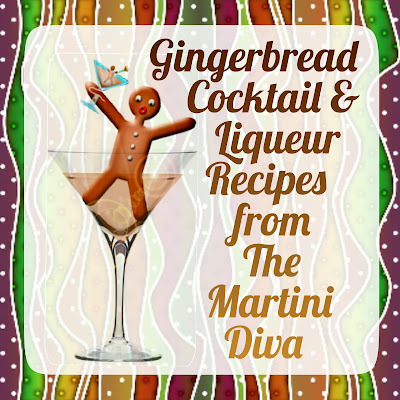 Of Dry Vermouth to the ingredients then follow the instructions for the Pickle Martini. Treat your friends like family and your family like friends. Please enjoy this red, white and blue cocktail as you celebrate our nation's military personnel and the sacrifices they made for our freedoms. United States Army: "This We'll Defend"
United States Coast Guard: "Semper Paratus"
United States Navy: "Honor, Courage, Commitment." 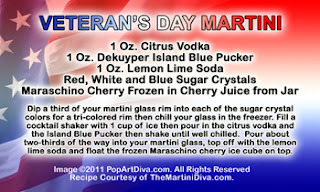 United States Marine Corps: "Semper Fidelis"
United States Air Force:"Aim High...Fly, Fight, Win"
Read more about Veteran's Day and what it's all about on the Veteran's Day Martini recipe page. Happy Veteran's Day and join TheMartiniDiva.Com in a moment of silence at 11:00 a.m. in honor of our troops, past and present. 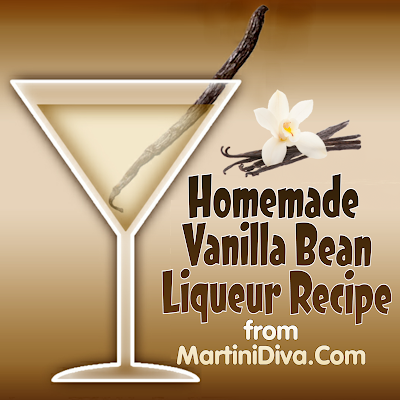 My Vanilla Bean Liqueur is a pure vanilla cocktail experience that can be enjoyed in cocktails or poured over cakes, ice cream and fruit for dessert. It's also really easy to make. 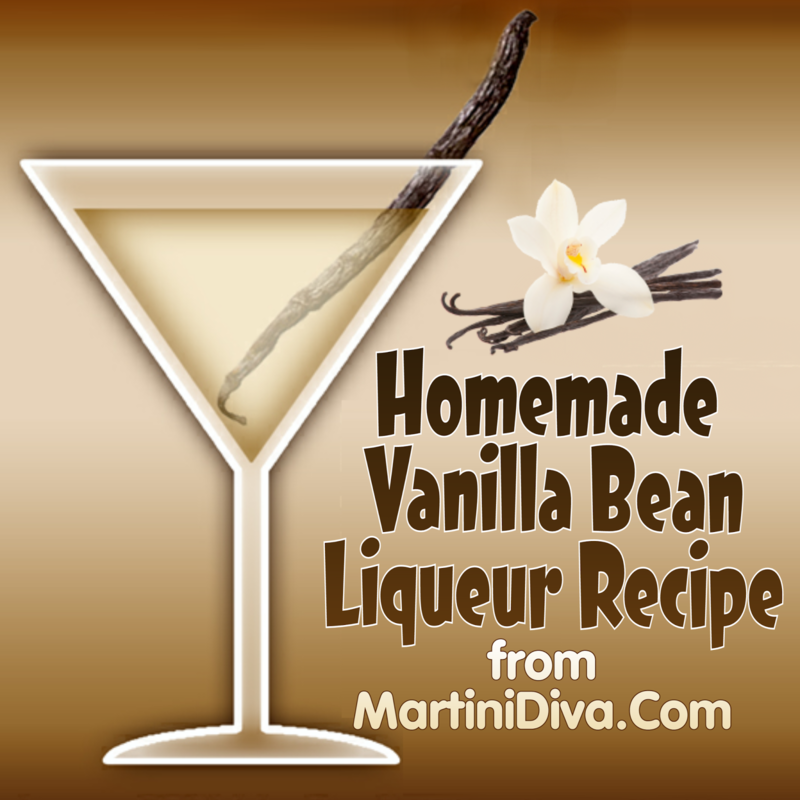 Plan ahead for this one if you can't find vanilla liqueur to purchase - my recipe for the homemade vanilla bean liqueur takes a month to infuse. 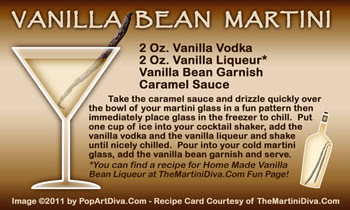 In your one quart infusion jar combine the vodka, split vanilla beans and the sugar. Seal the jar and shake until all the sugar has dissolved. Store in the fridge or a cool, dark location for two weeks to one month. The longer you allow the infusion to distill, the stronger your vanilla flavor. 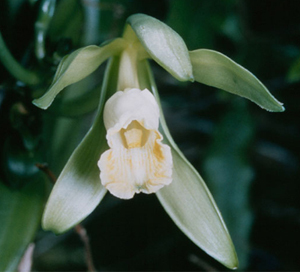 Remove the split vanilla beans. At this point you can, if you like, strain out any of the vanilla seeds by filtering through a metal strainer lined with coffee filters. 1.any of a variety of confections made with sugar, syrup, etc., often combined with chocolate, fruit, nuts, etc. Today is the day we celebrate our sweet tooth and give homage to those little bits of sugar, chocolate and other goodies that we love so much. 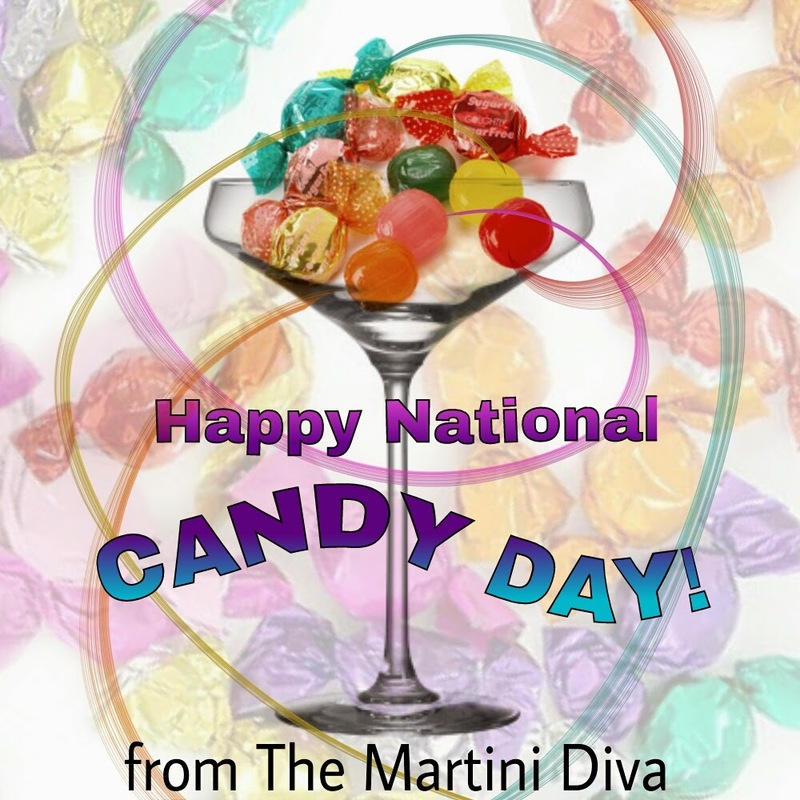 On the average, Americans eat 25 pounds of candy per person, per year. 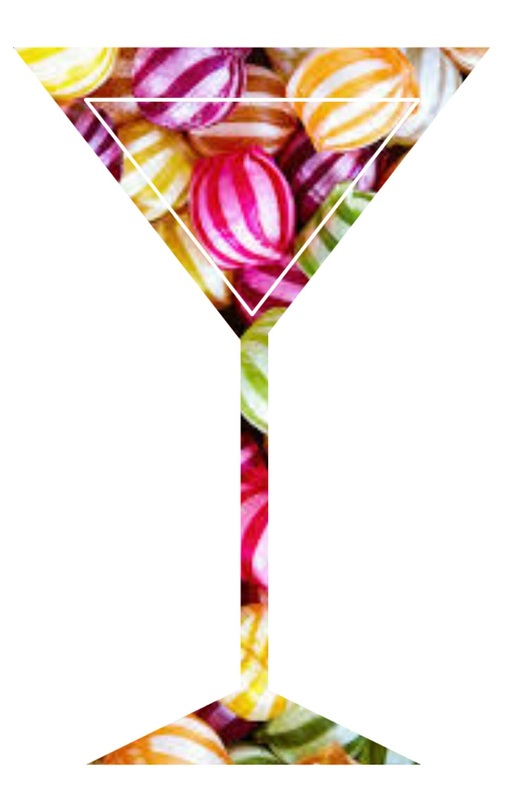 Candy is made by dissolving sugar in water but the different heating levels determine the type of candy produced. Commercial candies only became widely available around 130 years ago. Until then most candy was produced in the home. Candy accounts for only 6% of the added sugar in the American diet. Soft drinks and juice account for 46%. They found licorice in King Tutankhamen's tomb! 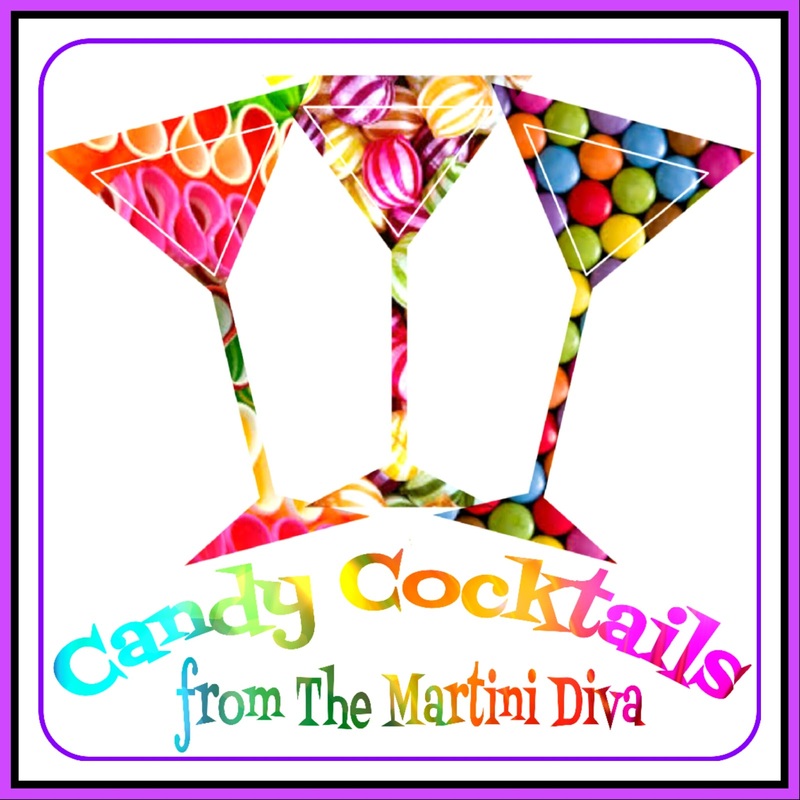 and Sweet Dreams from The Martini Diva!